An engineer at NASA’s Goddard Space Flight Center worked to install the first flight mirror onto the telescope structure at NASA’s Goddard Space Flight Center in Greenbelt, Md. 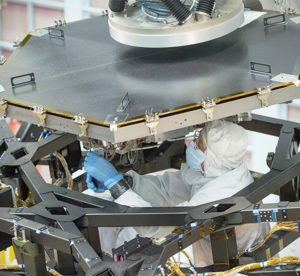 In the clean room at NASA’s Goddard Space Flight Center in Greenbelt, Maryland this week, the engineering team used a robot arm to lift and lower the hexagonal-shaped segment that measures just over 4.2 feet across and weighs approximately 88 pounds. 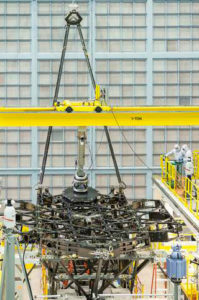 After being pieced together, the 18 primary mirror segments will work together as one large 21.3-foot mirror. The full installation is expected to be complete early next year. 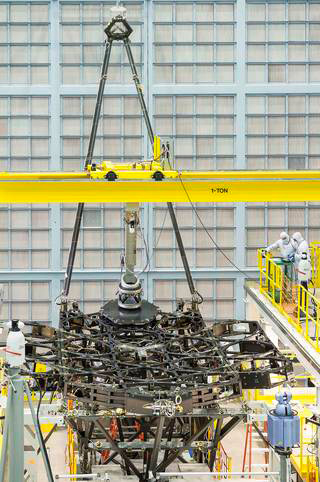 Inside a massive clean room at NASA’s Goddard Space Flight Center in Greenbelt, Maryland the James Webb Space Telescope Team prepared for the first flight mirror’s installation onto the telescope structure. 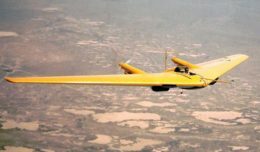 The mirrors were built by Ball Aerospace & Technologies Corp., Boulder, Colo. Ball is the principal subcontractor to Northrop Grumman for the optical technology and lightweight mirror system. 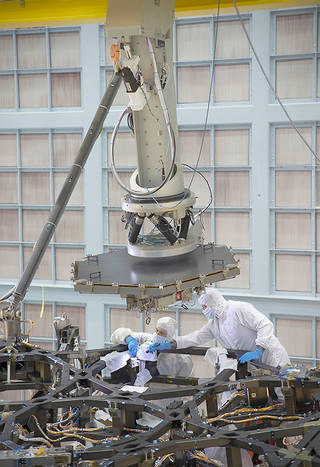 The James Webb Space Telescope team successfully installed the first flight mirror onto the telescope structure at NASA’s Goddard Space Flight Center in Greenbelt, Md. You can follow the mirror installation on a live webcam by visiting http://www.jwst.nasa.gov/webcam.html.